Blues Brothers sunglasses have revolutionized fashion scene with their radical design and it is considered the first stepping stone from a metallic eyewear to plasticized eyewear. 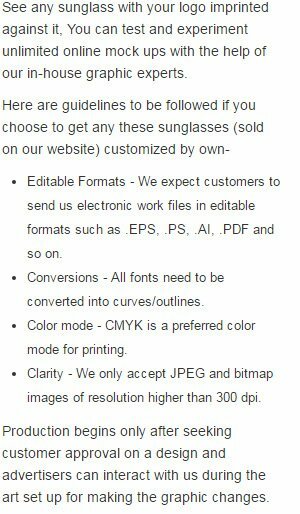 Custom Blues Brothers sunglasses can make a great gifting choice for advertisers who wish to catapult their brand name to new heights. Newbie advertisers or established advertisers working in hospitality, fashion, food, healthcare, beauty, sports – related niches can seek logoed promotional Blues Brother sunglasses for business gifting. People who receive these iconic sunglasses will never stop thanking because it accentuates their personality and adds to the masculinity. Personalized Blues Brothers sunglasses can be gifted out as a part of promotional sales during festive seasons, shopping events, or as an encouragement token during tradeshows, community functions, etc. Imprint Area: 2" X 5/16". UV400 protection.